1. Preheat oven to 375 and grease cookie sheet, I used baking paper in fact I wrapped this around the mixture to keep in in shape! 3. slowly add in flour and baking powder , nuts and cocoa and stir. it makes a thick and sticky mixture by the the way. 7. let cool then drizzle with melted chocolate, dip in nuts and have fun! Nice job!! Nothing better than homemade biscotti. Those would go great in the morning. or as an afternoon snack. The froth on the coffee looks amazing! Well done on the biscotti they look perfect. Those look so good! I definitely want to try those next :) I always thought biscottis would be really, really difficult to make but it wasn't so bad-- now I want to have some every week! haha. Glad yours turned out yummy as well! 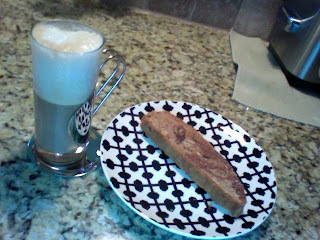 I like biscotti, esp soaked in coffee. that's why I like them as hard as bricks! 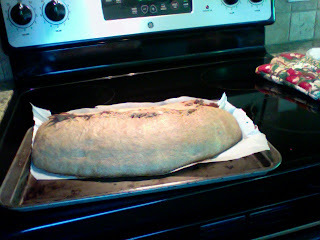 Homemade biscotti sound great! Excellent job! I would love some of that delicious biscotti with my coffee. They look incredible! Ooh, I haven't had biscotti in ages. Looks so Yummy! To make a printable version you need to make another blog that is very basic. Cut and past your recipes into a post in your basic blog, cut the photos and then click and highlight the post and go back to your regular blog and put in a hyperlink. I sure hope this made some sense. 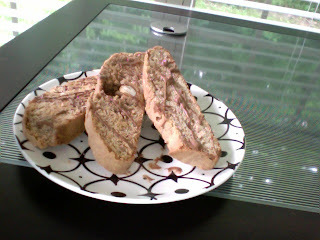 If you go into my other blogs you will see one that is called the ungourmet recipes. Take a look at it. Let me know it I can help more. 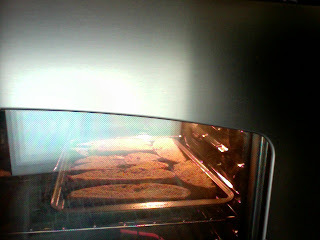 I love to bake biscotti and I love to eat biscotti. It's amazing how easy making your own biscotti is. It always turns out just like the picture in the book. I am not a good baker. I wish I could make my own biscotti! yours look great. Wow they looks su^per yumm, till now i have never made themathome. Looks wonderful! There's nothing better than homemade biscotti! Biscotti is one of those things that I didn't like for years, but now I love it! Oooh! What I wouldn't give for one of these right now . . .
come on over guys and get one, going going gone!! !